Russia looks primed to reap enormous economic gains when it becomes a full-fledged member of the World Trade Organization (WTO) this year, a new World Bank report said. Russian households incomes will spiral up in the near future, while average Russian workers will see their wages skyrocket, said the report, which was published on Tuesday. But some analysts said the report, which could influence investors’ sentiments, misses the mark and will only send the wrong signal to a Kremlin already saddled with worries over a stretched budget. This is because investors are paying close attention to Russia's near-term economic outlook as an indication of whether a new six-year presidential term for President-elect Vladimir Putin would bring the much-needed improvements to the country's poor investment climate, analysts said. According to the World Bank baseline scenario based on an oil price of $98 per barrel, Russia's gross domestic product will grow a mere 3.5 percent in 2012, and will slightly climb to 3.9 percent in 2013. With oil prices at $125 a barrel, Russia's GDP growth could reach four percent in 2012 and 4.2 percent in 2013. However, the bank believes that Russia's WTO accession will drastically improve the country's economic fortune. Russia should see its GDP expanding by about 3.3 percent, or about $49 billion per year, as a member of the world trade block, World Bank economists said in their quarterly analysis of the Russian economy. In the long term, when the positive impact on the investment climate is incorporated, the economists said the gains should increase to about 11 percent or about $162 billion per year. The estimated gains are not one-off, but will repeat each year as long as the country sticks to an open economy trade regime, the economists said. 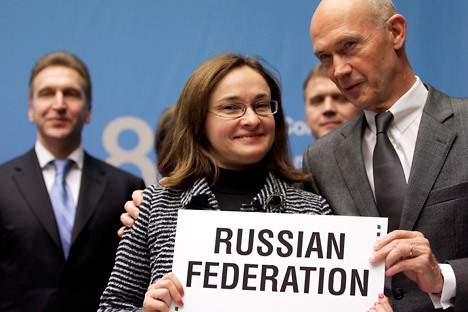 WTO membership will have a substantial impact on Russian households too. The average Russian household would experience a gain of 7.2 percent of its income each year, while more than 99 percent of Russian households will experience gains within the range of two to 25 percent of their incomes each year. Skilled and unskilled workers’ wages are supposed to increase by about five and four percent respectively in the medium term, and by about 17 and 13 percent in the long run. Skilled labor and urban households should gain relatively more than average due to the increase in foreign direct investment in the skill intensive business services sectors. However, rich households would gain less than the average household, since increased competition from foreign direct investment results in capital gaining less than labor. “The poorest households are estimated to gain at about the level of the average household, thereby reducing poverty,” said the report’s authors. There will be positive impacts at the regional level too. “All regions should gain substantially, but the regions that will gain the most are those that are most successful at attracting foreign direct investment, which depends on both location advantages and creating a good investment climate,” the economists wrote in their report. The regions likely to gain the most are the Northwest, St. Petersburg and the Far East. In a focused study of the telecommunications sector, the authors estimated that skilled workers’ wages in the telecom sector would increase substantially from foreign direct investment (FDI). “Multinational firms located in Russia employ mostly Russians and will increase the demand and wages for Russians with the skills needed in their companies,” said the authors. However, Russian analysts said that the World Bank’s upbeat forecasts are overly optimistic, even when juxtaposed with similar estimates from the country’s Ministry of Economic Development. The growth in real disposable income should be four percent in 2012, and 4.4 percent in 2013 when the benefits of WTO accession are taken into account, according to the ministry. “A seven percent growth in household income is simply overoptimistic,” said Sergei Karyhalin, an analyst on macroeconomics and strategy at TCB Capital. "That is a remarkably bullish forecast given the catalogue of cascading risks and economic headwinds earlier listed by the bank." Ariel Cherny, a researcher of Allianz ROSNO Asset Management, said Russia is unlikely to reap economic benefits from its WTO accession without undergoing radical economic reforms. “The overall optimism surrounding WTO accession wanes when one considers that systemic weaknesses persist,” Cherny said. "There's need to restore investor confidence, particularly through fighting corruption, strengthening governance and protecting private property rights."